A LIFE project to preserve indigenous Amphibian species against the spread of invasive alien Amphibians! The six-years LIFE CROAA project aims to improve the conservation status of local populations of Amphibians weakened by the presence of invasive alien species such as the Bullfrog and the African clawed frog. For this purpose, eight structures wanted to pool their skills to implement 17 actions in whole of France. The African clawed frog and the Bullfrog, two invasive exotic Amphibians of high concern! The African clawed frog is native of southern Africa and was introduced in northern Deux-Sèvres in France in the 80’s and now colonizes northern Deux-Sèvres, northern Vienne and southern Maine-and -Loire. 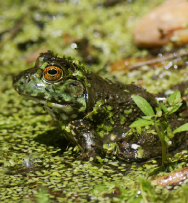 The Bullfrog gets its name from its song, a kind of cow moo. It is native from North America and was introduced in Gironde, Dordogne and Loir-et-Cher. Both species play a role in impoverishing the conservation status of local populations of Amphibians and aquatic invertebrates. They act by competition and by predation and are vectors for exotic pathogens, which may also be a significant threat to indigenous Amphibians. Created in 1992, the LIFE programme is a EU’s funding instrument, which the general objective is to contribute to the implementation, updating and development of EU environmental and climate policy and legislation by co-financing projects with European added value. In 2013, a new programme has been established for the period 2014-2020. It is organized in two sub-programmes: « Environment » and « Climate Action ». The sub-program “Environment” is divided into three components, including the “Nature and Biodiversity” component, in which the LIFE CROAA is integrated. Its specific objective is to contribute to the development and implementation of Union policy and legislation in the field of nature and biodiversity, including the Europe 2020 Strategy, and the Birds Directive and the Habitats Directive. 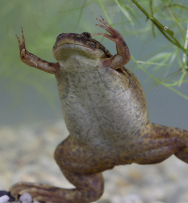 The Société Herpétologique de France (SHF) has teamed up with seven partners to propose a national project on invasive alien Amphibians present in France. The LIFE CROAA project focus in particular on prevention of the risks of new introductions, awareness-raising and training of local actors.